birds : I've taken a couple of weeks off from updating this diary whilst it has been so quiet. Nothing new seems to be arriving still. By the end of February, I suppose the winter birds have got as far south as they are going to do and are just biding their time before returning north. There are signs of spring though with the thrushes singing and Magpies nest-building across the way. moths : Moths have started to appear at the windows, so things are starting to emerge - but nothing unusual seen yet. There are more insects flying around the garden, including lots of tiny flies with hairy wings that may be mistaken for micro-moths. These are called Moth-flies or Drain-flies or Owl-midges (I think). nonsense : The half-term holidays are just finishing so it has been trying to keep the kids occupied whilst at the same time trying to keep our sanity. 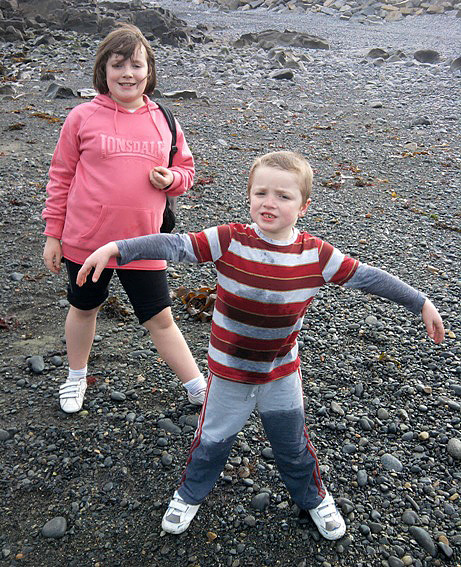 I took the kids to Fort Doyle where we spent ages and ages just throwing stones into the sea. It's such a simple thing but it gives so much pleasure and satisfaction. I remember spending ages and ages doing the same thing when on holiday when I was a boy. 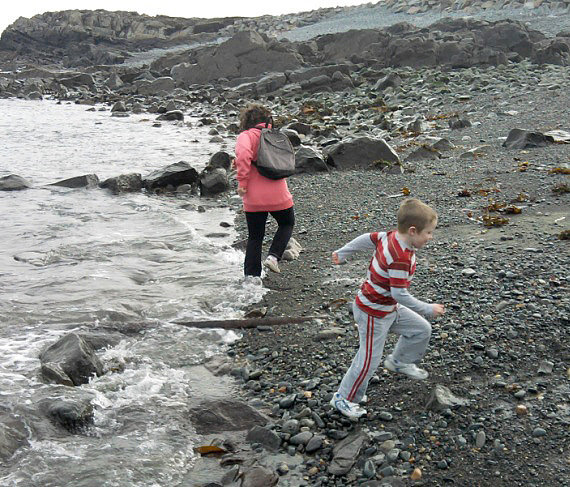 Our visit also involved the classic "waiting til the last minute then running away from the waves". Above is Abigail not quite making it, and below is the inevitable conclusion to such a game . . .
Abigail is clearly very sympathetic. 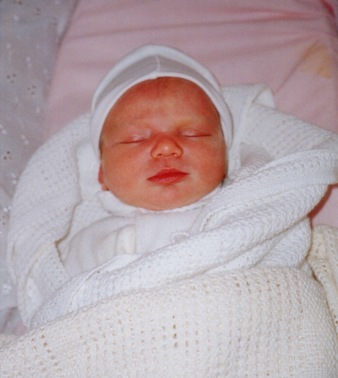 She had her birthday last week and she is now ten years old which means of course that I am officially ancient. We have had her for a full decade - quite incredible. birds : The less said about the weeks birding the better - year-ticking Stonechat is hardly a highlight. Although, is it just that my 'highlight threshold' is so high nowadays? A beautiful, sunny winters day this morning and, as I finished my cup of tea by the back door, a Peregrine blasted overhead, and then a female Marsh Harrier drifted low northwards. I looked up at both birds, but didn't even reach for my bins which were just a couple of yards away on the fridge. Rewind 20-odd years, and my teenager-self would have been having some kind of fit after such an amazing sighting. Both species would have definitely been classed as magical at the time - the harriers were only ever seen at distance quartering the reedbeds on my annual Norfolk trips, and I'd only ever seen Peregrine once. 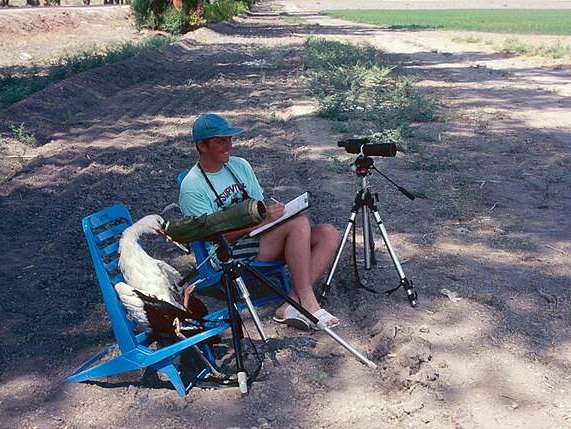 I guess this is why many birders "phase". You see them around for a while and they are dead keen and birding all the time, then all of a sudden they stop seeing new things all the time and then gradually stop looking. If you don't 'phase' then birding must have taken hold of your DNA, and you have no choice in being a birder. Birdwatchers are into birds - Birders are into birding. It may be a subtle difference, but it's an important difference. Anyway, enough of that clap-trap, the most important bird story of the week - the second release by Gyr Crakes, called 'Tart the Gyr'. A few of the people featured in the video look somewhat familiar . . .
moths : The Entomologist's Record arrived through the post this morning and the main paper was that a new 'British' species had been found in Guernsey, which will be called the "Southern Grass Emerald". Of course I knew that this was the case but I have not been able to mention it until Philand Peter's paper had come out - Lepidopterists are very secretive. 'Small Grass Emerald' had been recorded from Guernsey on and off for over 100 years, but a few years ago Phil Sterling looked at the habitat and thought it a bit odd. So during the last few summers we have been searching the area (Pleinmont) and catching some individuals and Phil eventually confirmed that the moths were not the 'Small GE' but its more southern counterpart Chlorissa cloraria, which occurs mainly in southern France and the Med. It is only very subtly different but, as in a lot of cases with moths, habitat choice is the key. And it was nice to get an acknowledgement. With no numbers or markings we have had to just use the 'Force' to turn the dial to the right place. I was fine with this, and being a Yorkshireman, I preferred to carry on like this than buy a new one. But recently the top shelf has kept falling off onto the bottom shelf when fully laden with cups, regularly turning the air blue, we have had to sort it. This means however working out the most efficient way of filling the new dishwasher - it's like a giant 3D jigsaw puzzle - it is a daily challenge to shove every single item in, so that we don't have to wash them by hand. I have actually achieved a black-belt in dishwasher-filling. birds : No new rarities arriving here, so pretty much as it was. I saw the wintering Water Pipit at Fort le Crocq yesterday but that's all. Now that they are working on building the new school adjacent to ours, they have cut down the line of trees across the playground from the staffroom. This means that whilst having my numerous cups of tea at breaks and lunch etc, I now have excellent views across the island, right across Grande Mare to Vazon. With the first sunny days for ages this week, I saw two Buzzards soaring one day and a massive Peregrine fly past the next. It is such an excellent viewpoint that during the Spring, it has the potential for some good soaring-bird sightings. I shall have to secrete an old pair of bins in the staffroom somewhere just in case. Didn't take any photos this week, so here's an old photo of me surveying raptor migration in Israel in 1993, making friends with the locals. I compiled the Societe Bird Section Annual Quiz the othernight. How many can you get right? Q3 – Match the species with the rump colour? Q4 – These subspecies have been recorded in Guernsey – which species do they belong to? Q5 – Which species are these commonly-used nicknames referring to? Q6 – Thesaurus Puzzles – which Guernsey List species are these? Q7 – Which species has been seen 7 times in Jersey but never in Guernsey? Q8 – Which 4 species are on the Sark list but have never been recorded in any other Channel Island? Q9 - Which 12 species on the Guernsey List have a common english name made up of three separate words, no hyphens? Q10 – TIEBREAKER - How many species did Cecil Smith list in his “Birds of Guernsey” in 1879? birds : The birding doldrums are upon us. It seems at the moment I am preferring to sit cosily in the staffroom rather than giving it some welly at lunchtimes. And it will probably be so now until April. I did visit the Grande Mare/Rue des Bergers area on Tuesday lunch and was pleased to see that the Goldeneye was still present on the pond. 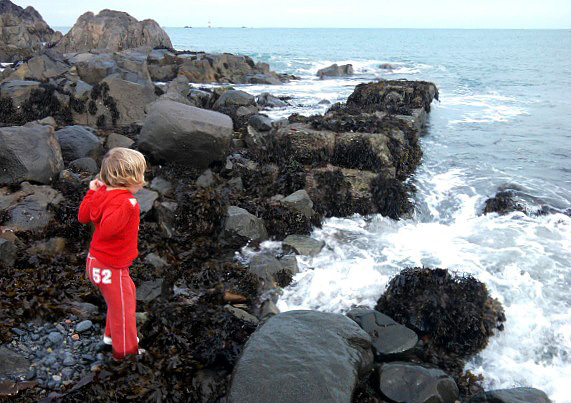 This stream at the Grande Mare is most probably the largest river in Guernsey! Along the stream bank were lots of Winter Heliotropes, one of the few plants that prefers to flower in the winter, and smells strongly of vanilla. 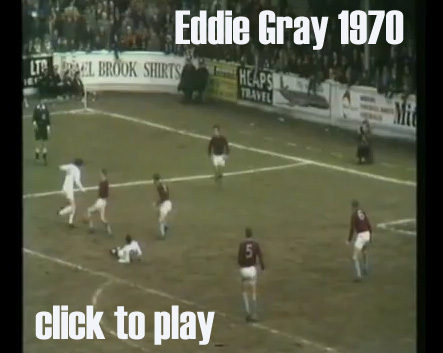 nonsense : With Leeds United doing so well in the Championship at the moment, and with them giving Arsenal such a good game in the FA Cup, I thought a bit of Eddie Gray magic might be a good idea. Eddie was my boyhood hero although I only saw him late in his career. Can you imagine a better pair goals scored in the same match? It is a good job that I spotted this notice because I was just about to throw it down the stairs . . . .
birds : The Winter has warmed up again to typical temperatures, which means no new arrivals escaping the cold. So pretty quiet out and about. I have spent some time searching for the Pacific Diver to no avail. There has been Great Northern at Grandes Havres regularly but no sign of the rare one. Two more Great Northerns were in Cobo Bay mid-week along with a Slav Grebe. The other sighting of interest was an adult Yellow-legged Gull at first light on Vazon Beach on Wednesday morning, but the sun was not high enough for any decent photography. It is a Dusky Thrush - one of the 'most wanted' birds in Britain - and nobody saw it! It was snapped by a fella in Leigh in his garden and the nations twitchers are gnawing on their tripods in frustration. If I looked out of my window and saw this in front of me, my eyeballs would literally jump out of their sockets. Click here to see a report on the sighting. nonsense : During the week this monstrosity has appeared peering over our garden wall. So now I go to work next to a building site and them come home next to a building site. No problems yet, although I see potential for some "doinme'eadin" in the future.